warehouse was the hub of the companies bottling, storage and distribution operations supplying four shops in Cork and one in Limerick. The building was constructed between 1873 and 1875 at a cost of £4,500. When completed in 1875 the building was considered one of the finest in the city and today continues to be a listed building. The building with its cut limestone frontage has thick floor and roof beams made from imported Canadian white pine to support the weight of the full casks of wine and spirits stored in the warehouse. On the ground floor, you can still see the vaulted ceilings of the original cellars and throughout the building the thick stone walls built with master craftsmanship are on view everywhere. Over 10 years supply of whiskey, casks containing over a million bottles of wine, sherries and ports and more than 50,000 gallons of choice Cork and Dublin whiskies, Scotch whiskies and fine French brandies were all stored from seven to 10 years in wet and dry cellars. Subsequent to a fire the building was restored and in 2001 received 1st Place in the Cork Corporation 'Better Building Award' for the restoration of a historic building. The warehouse is open Monday - Friday from 11am to 11pm and at weekends and bank holidays from 12 noon to 11pm. Come on in and enjoy tea, coffee, lunch or evening meal in this historic building. 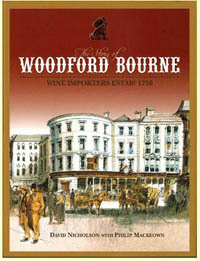 A book entitled 'The History of Woodford Bourne', written by David Nicholson a member of the family, was successfully launched in the warehouse in 2005. The book is on sale at the warehouse for €35.